In my experience, making a book is a slow and oddly tense undertaking. For my current project based on the first chapter of Margaret Fuller's Summer on the Lakes in 1843, the initial challenge was accurately transcribing the original text, including checking on antique spellings such as visiters and choak. Because I am not using imposition software to organize the folios of words and image, I have to depend upon myself to make sure everything is in the right order and right-side-up. As any proofreader knows, this is a challenge when you are really, really familiar with the text. When the twenty-two folios of this book, five folded pages each, were assembled, I was ready to sew them together. 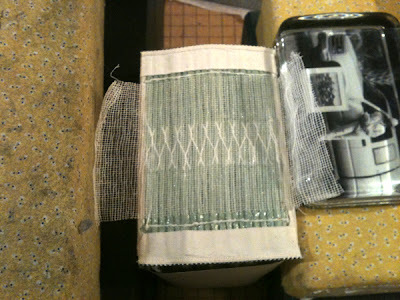 You might imagine this to be peaceful, meditative process, but hanging on to the ever-tall stack of pages while wielding the needle and waxed thread, not tying myself in knots, is no easy task. Gluing up the sewn book block brings stability and a growing sense of bookiness to the whole thing. As of this morning, the body is secure, the end bands tight and straight, and Ms. Fuller's heady description of Niagara Falls is ready for a spine.